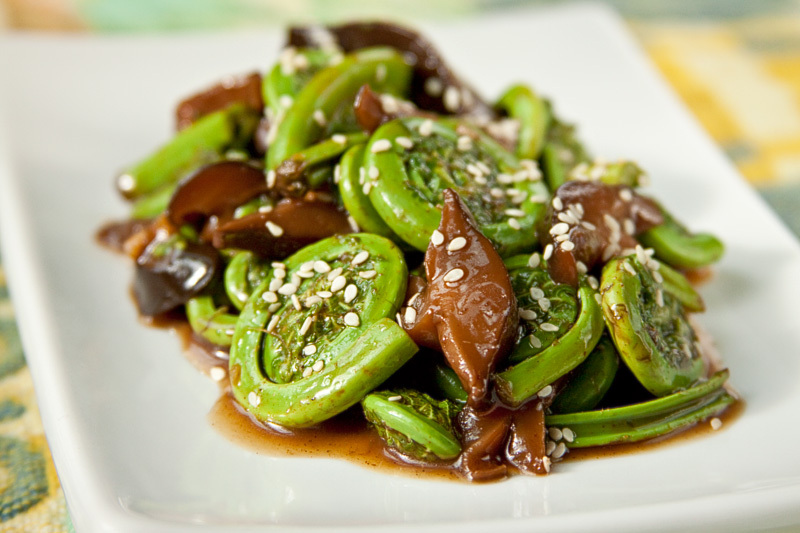 Fiddleheads just seem to go naturally with mushrooms. While fiddleheads are frequently seen in the company of morel mushrooms, it’s not often you see them paired with shiitakes. We served this delicious combination at the last Earthy Delights Open House and it won rave reviews. It’s now a standard on our spring menu. Place dried shiitake mushrooms in a bowl and cover completely with warm water. Allow to soak for 20 – 30 minutes or until completely soft and pliable. Drain the mushrooms and remove the tough stems with a pair of sturdy scissors and discard. Cut each mushroom cap into several thick slices, about 1/4-inch in width. Quickly bring to a boil, taking care that the pot doesn’t boil over. Reduce the heat to medium high and allow the liquid to cook down until it thickens. Remove from heat and set aside to cool. Meanwhile, rinse the fiddleheads and trim ends if desired. Bring a large pot of salted water to a rolling boil. Blanch the fiddleheads by placing them in the boiling water. Allow the water to return to a boil. 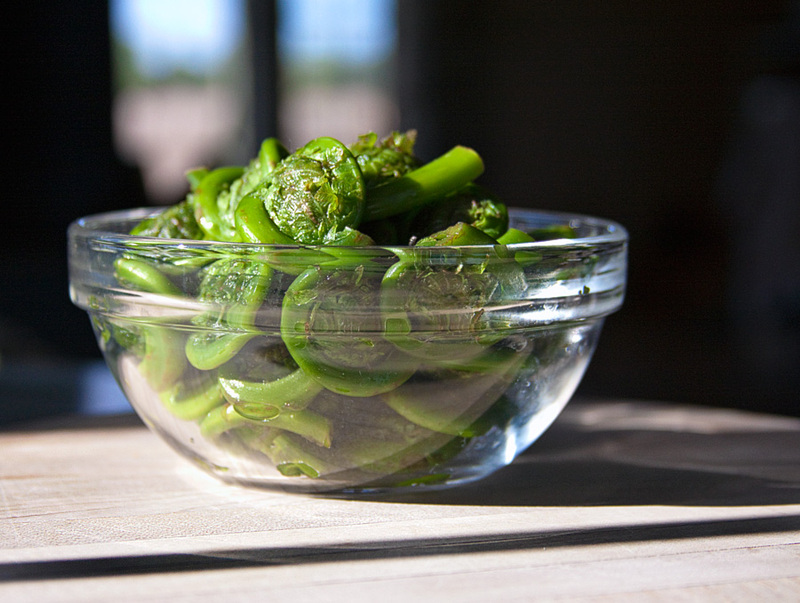 Remove immediately from heat, drain and quickly plunge the fiddleheads into a large bowl of cold water. Drain again. Toss the fiddleheads together with the shiitake mushrooms and any remaining mushroom cooking liquid. Sprinkle with sesame seeds and serve. Having grown up in Vancouver, I am definitely a fan of fiddelheads. What a beautiful way to highlight them. Those shiitake mushrooms look sumptuous.